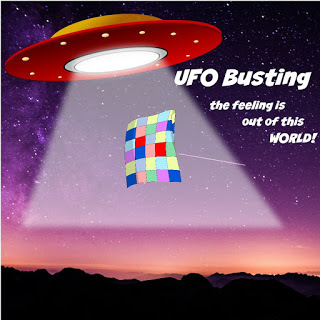 Welcome to Tish's UFO Busting party! While she is busting up UFOs and stompin' all over them, eating pie, and doing some shopping with blogger friends in Ohio, I am hosting the party for her this week. First of all, here is the ongoing progress on my 150 Canadian Women Quilt Along project. 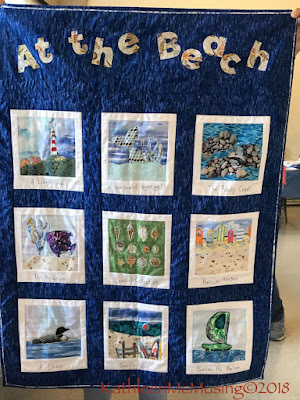 This was a quilt along run by Kat of Next Step Quilt Designs. It was three 6" blocks per week for something like nine months. I've been making my 1" finished sashing strips and cornerstones, and sewing the blocks into rows mostly as leader/enders. It is humongous and I love it. Here are nine of the thirteen rows. I sewed the first six together and now I'm working at sewing the bottom seven together, and then I'll join the halves and start the borders. I finished a knitting project for which I've had the yarn for about six months. It's sitting on the ball of yarn as I didn't feel like doing a selfie, though it fits me wonderfully! Therefore, I will have to make another, as this one is for Brady. 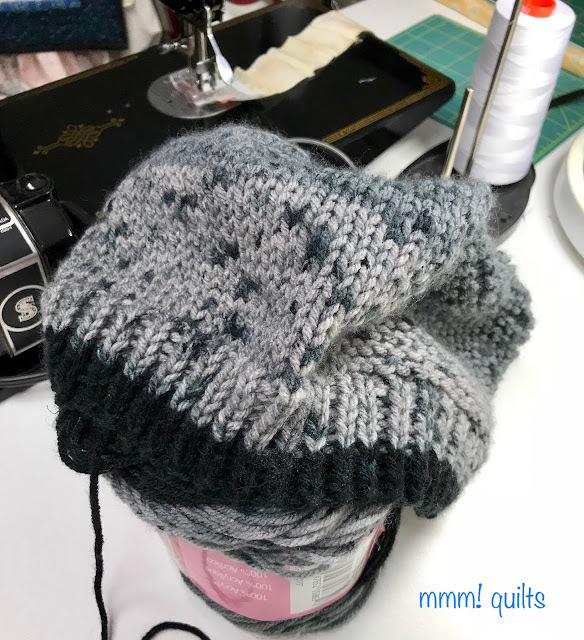 It's called a Barley Beanie and I got the yarn and pattern at my LQS which also stocks a fabulous selection of yarns. The check batiks are out this month! They really are wonderful. I love it! Had no idea I'd be making a quilt this big (it is 60.5" square) but I did. If you follow me on Instagram (@mmmquilts) you'll have seen some sneak peeks of my quilting on it. And by the way, if you know what this tree is (maybe a Norway maple? maybe a sycamore maple? it's a humongous tree) please let me know in the comments. *Note I've changed my comments to opening in a popup window, which I actually do not prefer, but I suddenly can't comment on blogs who use blogger, like me, with embedded comments boxes. That means the comment box is at the bottom of the post, which I like, and which I've had for all but a week of the 5 years I've been blogging. It's most annoying as to what's happened. I have one more fix I'm going to try this weekend: log out of ALL Google accounts, which means YouTube, Air BnB, and a gazillion other apps I use my gmail for, on ALL devices, and restart all those devices and log back in, not using autofill. I read that somewhere but it was a fix from a couple of years ago, so no clue whether it will work. Anyhow this is Janice's bee block, made by Sue. 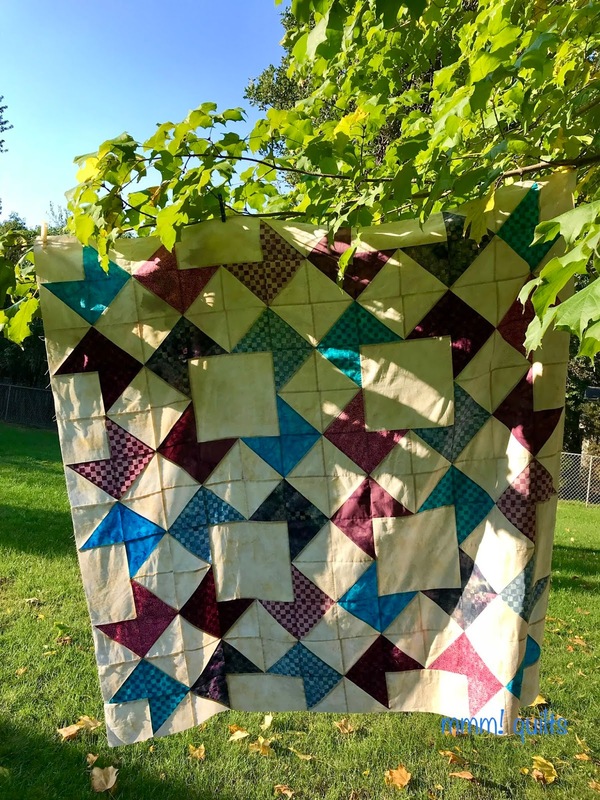 I love that Janice, Color Creating and Quilting (that link will take you directly to her post where you can see all the blocks on her design wall! ), chose my block, and I love that Sue made a second one for her because Kate, Smiles from Kate, is out of action for a while (send hugs). Kathleen finished her At the Beach challenge quilt. Because I live a mere two minutes' walk from the north shore of Lake Erie, I have an extra-special affinity for her quilt. Blue happens to be my favourite colour too. I love the polaroid setting she chose, and the fabrics are just delicious. Truly. Okay, let's see what projects you've moved along or finished up this week! Link up below. The linky will be open until midnight Tuesday, October 16. You've been busy! The beanie cap looks very warm and stylish (hopefully Brady will think so too). 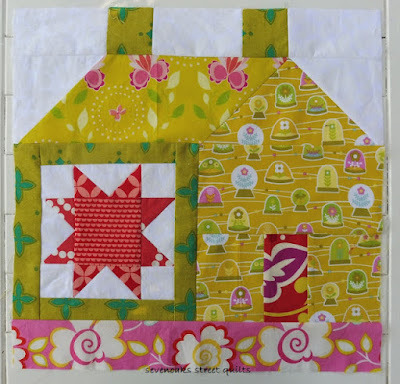 Love the colors in your Island Batik Challenge quilt. 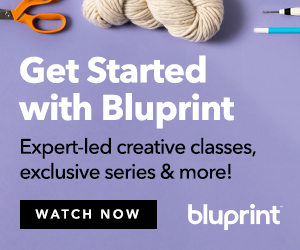 Hope you get in lots of stitching time this week. Did you solve your commenting problem? I have no idea what that mystery tree is, but I sure do like the stars quilt! Plaid batik? I have to check that out. I linked up because the fabric had been in my stash, so that means it was UFO seed, right?? Haha. Thanks for hosting the linky in Tish's place! 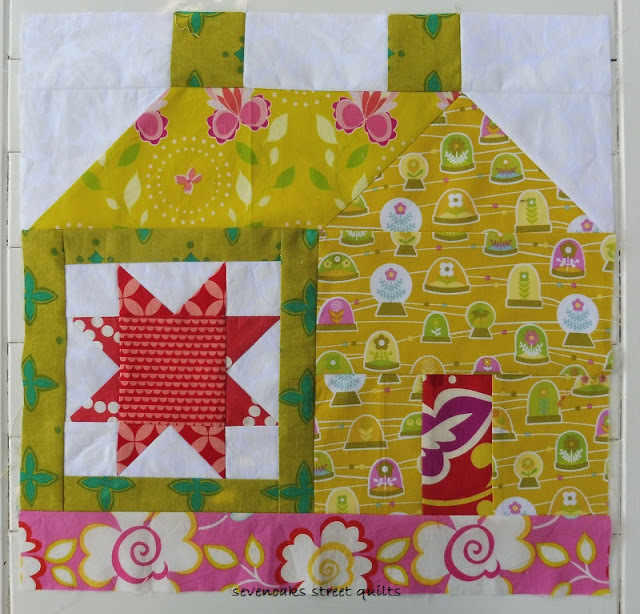 I love the star batiks quilt and 60 1/2'' square yup I know how big that is. Not sure about your tree, it doesn't look like a Norway, are the leaves shaped like a traditional maple. 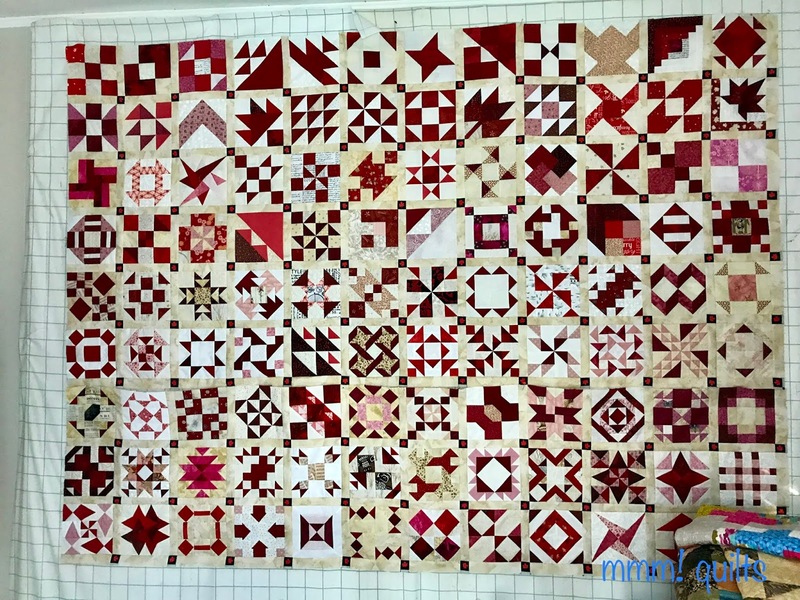 I love how your red quilt is looking. So pretty and big! Thank you, for hightlighting my little quilt. It was a fun way to make! I love the way your stars are turning out. They will be so gorgeous when you get our quilting into it! I'm back but having trouble getting back into a routine and back to sewing. Need to re-assess what I've got on the go. Thank you so much for baby sitting the party for me this weekend! I wasn't near a computer the whole time...yikes!